Wars are not fought to spread democracy, to liberate women, or to depose dictators. Nor should they be vindictive acts to wreak vengeance. Nor should they be impressive displays of military might. They are meant to annihilate the enemy. There was a purity and singularity of purpose guiding Allied armies across Europe and American forces across the Pacific. In WWII there were no questions of geopolitical advantage, negotiation, or temporizing. After Pearl Harbor America woke up from its military slumber and led the campaign against the Nazis and fought bloody, uncompromising, and ultimately victorious battles from Guam to Tokyo. All resources were mobilized in World War II. The American economy was quickly converted to a wartime machine. American men were recruited from every class and region to fight the Germans and the Japanese. Washington propaganda which vilified Hitler and Tojo portrayed them as evil, stoked ethnic and racial hatred, and coalesced the country into an irresistible force of might and destruction. There was no question of bombing enemy cities. Dresden, Tokyo, Hiroshima, and Nagasaki were not considered off-limits and no distinction was made between combatants and civilians. We were at war not only with Hitler, Tojo, and their armies, but with the countries of Germany and Japan themselves. We made no distinction between the regimes who started the wars and the people who supported them. All American wars since WWII have been lukewarm and hesitant. The magnanimity shown by the US to both Germany and Japan in the post-war period leaked into the Pentagon, morphed into versions of American Christian exceptionalism, and led us to fight half-heartedly. 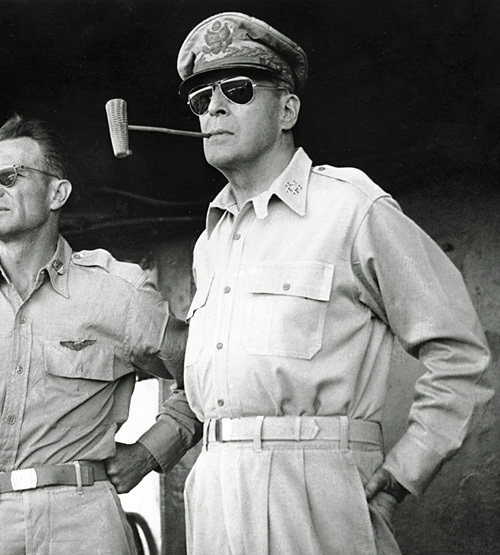 MacArthur had the vision to win conclusively and absolutely in the Korean War but was fired instead of leading his armies into China. America felt that winning the hearts and minds of the Vietnamese was the key to success, especially when its limited although frightening bombing of the North had little effect whatsoever. We bombed harbors, military redoubts, and the Ho Chi Minh Trail, but left the cities, villages, and hamlets alone. Escalation of the war and the all-out annihilation of the enemy was never a serious option. Bombing North Vietnam ‘back to the Stone Age’ was never seriously considered. Not only did it risk internationalizing the war and engaging a Chinese enemy who was as implacable and motivated as the North Vietnamese; but because our moral philosophy was changing. Winning at all costs was not an American thing to do if those costs included innocent lives. The war in Vietnam, then, became one of American attrition. Long before our military resources were depleted, our resolve was gone, and we were sent packing. The second Gulf War – the war in Iraq – was questionable at best; but after the decision was made to invade the country, no plans were made to achieve total victory. In fact, the United States had no real idea what victory was. Some said ‘regime change’ – rid the country of the evil Saddam Hussein, and Americans would be cheered in the streets as conquering heroes. Freed from the chains of a hated dictator, the people would embrace liberal democracy and free enterprise. Others said that the war was about oil, yet another militaristic enterprise to secure scarce world resources. Others commented that it was George W. Bush’s campaign to finish his father’s war. And still others considered that a newly democratic, Western-leaning Islamic nation would be a staunch ally in the continuing wars in the Middle East. Without a clear idea of what victory was, and hamstrung by even more sympathetic notions of protecting civilian lives, the US effort was doomed from the start. The United States could have invaded, dominated, and controlled every major city in Iraq and established a brutal and uncompromising martial law. It would have been a complete and total defeat of Saddam Hussein, his army, and his supporters. Looters and dissenters would have been shot. Merciless house-to-house searches would have been carried out. Public executions of those who violated martial law would have been common. The American army would have been feared and respected. Such unsparing and merciless enforcement of the occupation would have eventually led to a more stable and rehabilitated society. The Romans came, saw, and conquered; but they stayed, and as a result half the world owes culture, administration, law, and infrastructure to them. Such advance planning – clear definition of goals and objectives; objective calculation of investment costs and liabilities – would have surely prevented the war. Even if harsh post-war measures were to have been put into place, even the most repressive occupation might not have tamed the wild tribal and ethnic rivalries in the country. The point is only that IF we are to go to war, we should know why, never lose sight of the goal, and be as potent, dominant, and terrifying as possible in a winning effort. The war in Afghanistan reflects the same lack of clarity and singularity of purpose. For all intents and purposes the war was to wreak vengeance on the country which harbored Osama bin Laden. Even a cursory look at recent history would have shown that any armed intervention in Afghanistan would end up badly, especially when we had no clear objectives. Was it to teach the Taliban a lesson? To annihilate them? To set the girls and women of the country free? To establish a liberal bulwark against Iran and Pakistan? Once again, hearts and minds were foremost, and scorched earth strategies were off the table. It would not have been inconceivable for an overwhelming American military force to take over and occupy every major city and town in the country, to rule it with relentless severity, and to neutralize the enemy. If we had considered all this, more than likely we would not have gone to war; but if we were so determined, then the Curtis Lemay approach might have been successful. This military indecisiveness and hamstrung operations would be bad enough; but US foreign policy designed to prevent war while securing American interests has been just as indecisive and myopic and trapped within an outmoded vision of American exceptionalism and Christian charity. We have come a long way from the realpolitik of Henry Kissinger and even farther from his historical mentor, Machiavelli. Even if we could be convinced to act boldly in our self-interest, the current administration cannot figure out what that self-interest is. There is no doubt that we should have backed the Egyptian military, our longtime political ally and only friend in the Middle East other than Israel. Backing ‘democratic’ reform would inevitably lead to Islamic militancy, more repressive regimes than the military ever thought of, and further erosion of our influence in the region. As hard as is to stomach now, we should have maintained our friendship with Assad, a moderate (socio-politically) ally. Had we finally faced the truth that America’s war is with a determined, amoral enemy – radical Islam – one even more implacable and violent than the Viet Cong, then we would have encouraged the Syrian regime in its attempts to neutralize it. Had we done so, the civil war would probably never have happened and thousands of lives would have been spared. Our idealistic notions of a moral foreign policy reinforced by political rectitude, are behind our weak and pitiful response to Putin and Russia. We still believe in the the notion of a ‘sovereign state’ even one as corrupt and incompetent as Ukraine. We believe in the concept of universal democracy, where everyone has a say, and no one is denied a vote. The rest of the world, with the exception of Western Europe, Australia, and New Zealand, believes differently. History did not end as Francis Fukuyama predicted – it simply fractured into thousands of pieces and returned to its former state. Putin understands history, power, and the fallacy of representative democracy. He knows that there will always be self-interested enclaves defined by culture, language, religion, and ethnicity; and even if they vote democratically, they will vote to exclude others. Finally, we are hobbled by our Christian morality. We cannot understand how al-Qaeda, the Taliban, Boko Haram, or Hamas can blow up civilian busses and indiscriminately massacre children. The radical Islamic enemy is evil. The enemy is not evil or immoral seen within their perspective. They are simply more explicit about their goals and more determined and ruthless in their tactics. The ends justify the means, they say; and are no different than our firebombing Dresden and Tokyo or dropping the atomic bomb on Hiroshima and Nagasaki. We have ‘evolved’ to what we consider to be a more progressive and humane military policy and thus weakened ourselves. They have acted no differently than the marauding armies of Genghis Khan or those of the Crusades. Take no prisoners. Military strategists talk of ‘asymmetrical warfare’; but they have not considered the skewed geometry of our war with radical Islam. How can we possibly defeat an enemy if we don’t play by his rules? Enemies from the Taliban to al-Shabab know that we will always keep most of our firepower in the stockade and that we will only fight careful wars. Not only do we not want to harm civilians, we organize our battles as much to limit American casualties as to wreak havoc on the enemy. War is hell, and we should do our best to avoid it. But since this is an utter impossibility, we should only fight wars that are clearly and unequivocally in our national self-interest; fight them to win; and win at all costs.